The golden-cheeked warbler (Dendroica chrysoparia) can be found only in the juniper-oak woodlands of central Texas. The male often returns to the same nesting site each year, and the female makes a nest with strips of juniper bark, woven together with spider silk and insect cocoons, and lined with grass, hair or down. In recent times, it is the only bird to nest entirely within the state of Texas. In 1990, the U.S. 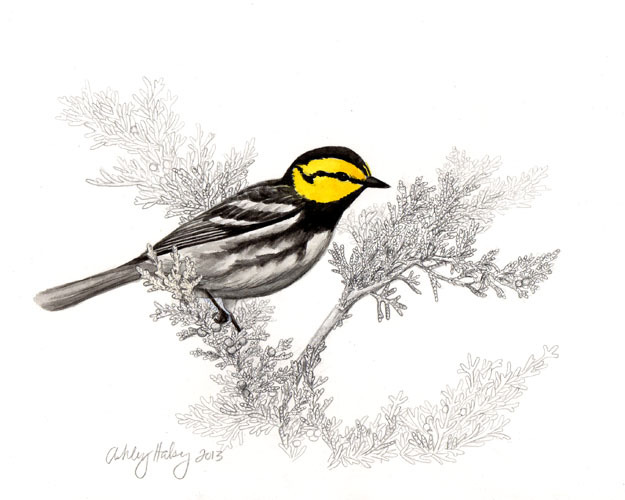 Fish and Wildlife Service listed the golden-cheeked warbler as Endangered (1), and the species is also listed as Endangered by the Texas Parks and Wildlife Department (2). As with many song birds, the main threat is habitat loss. Much of its breeding habitat has been cleared for development, agriculture and reservoir construction. Global warming also poses a threat to songbirds throughout the country(3). More information can be found about the golden-cheeked warbler and what is being done to conserve it here.